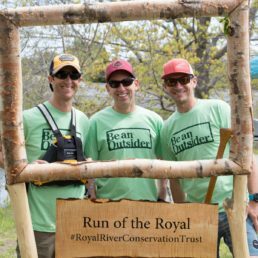 The fourth annual Run of the Royal Corporate Canoe Challenge — presented by Maine Beer Company — will be held on Saturday May 18th, 2019. 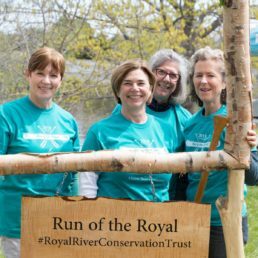 This four-leg, flatwater canoe relay race supports the Royal River Conservation Trust and our plans to acquire and improve public access and shoreline habitat up and down the river and throughout the Royal River watershed. The race’s relay format, with eight racers paddling four legs (two paddlers/leg) is a great team-building opportunity. Though the race is targeted at company and employee teams, any group is welcome to participate. We focus our race culture on teamwork, safety, and community. 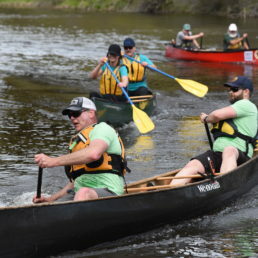 Let us help you build your brand by sponsoring this successful and exciting event, and build your employee team by registering an eight-person canoe relay team for the race. 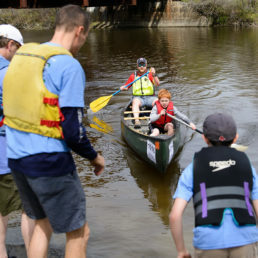 The canoe race brings together nearly two hundred local professionals and residents as paddlers, and hundreds of others as spectators. Partner with us by sponsoring the race, and receive great visibility. RRCT events and projects are regularly recognized by statewide and greater Portland media. RRCT email newsletters are sent to nearly 2000 residents and businesses. RRCT’s website and social media pages are visited by thousands of viewers. To see the menu of options online, and to pay online for sponsorship or team registration visit: RRCT’s online Business Partnership contribution page. 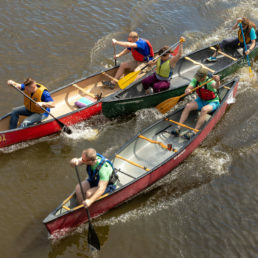 Register for the canoe race early for $475. After April 20,2019 all registrations cost $550. Non-profit teams register for $350. This document provides the same menu of options, and allows you pay by check: RRCT’s Business Partnership form & invoice (PDF). 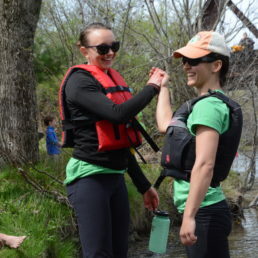 Wednesday May 15, 2019 5:30 pm to 7:00 pm Free paddlers’ clinic for racers hosted by L.L. Bean at Yarmouth History Center, East Elm St., Yarmouth. 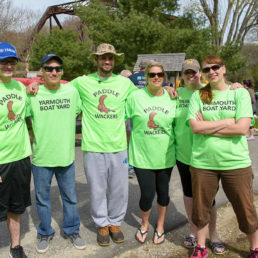 Saturday May 18, 2019 9:30 am– Pre-race paddlers’ meetings at the boat ramp at Yarmouth History Center. 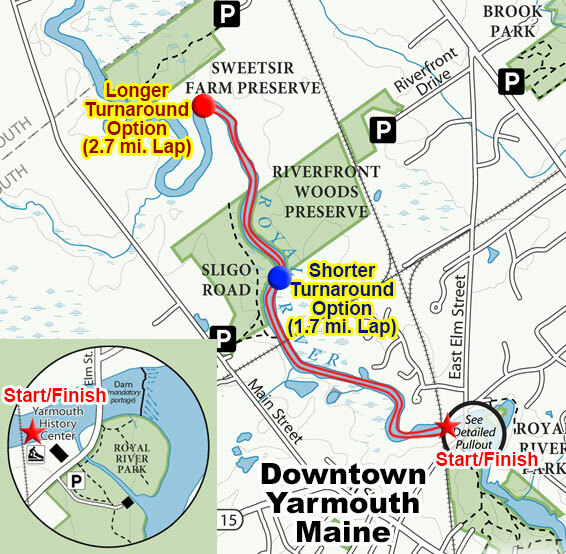 Saturday May 18, 2019 10:00 am – The race starts at Yarmouth History Center. 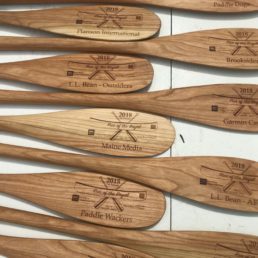 Saturday May 18, 2019 3:00 pm – Maine Beer hosts paddlers, guests, and others at Maine Beer in Freeport for a post-race celebration. The relay race course begins and ends at Yarmouth History Center on East Elm Street in Yarmouth. 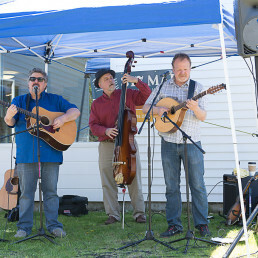 The Yarmouth History Center bustles with live music, food vendors, an art show, raffles, and the History Center’s excellent exhibits. New in 2018 and continuing in 2019, we are able to track your team’s position on the river, courtesy of Garmin’s InReach technology. There are two course options: We offer a long loop: 2.7-mile out-and-back, and a shorter loop, 1.7-mile out-and-back. (see the race course map below). The top three team finishers in both lengths will receive awards. The longer loop takes anywhere from 30 to 55 minutes per leg depending on your team’s skill and effort level, and the shorter loop takes 20 to 35 minutes. We recommend the shorter loop for less experienced paddlers and teams looking for a more recreational experience. 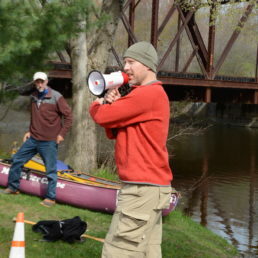 We also offer paddling clinics in the days leading up to the race, with support from LL Bean and Maine Beer. Check out the schedule for details. Current plans for the clinic is the Wednesday prior to the race. Course map showing shorter and longer options. The race’s relay format,with eight racers paddling four legs (two paddlers/leg) is an amazing team-building opportunity. Though the race is targeted at company and employee teams (with their friends, kids and others), any group is welcome to participate. Can’t find eight paddlers? A single paddler may paddle as many legs as they wish. For example, pull together a team of four and have each paddler do two legs. 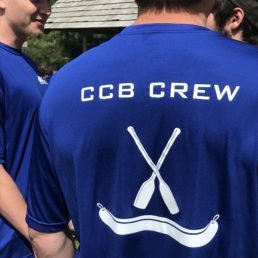 Family members and guests are invited to join company or organizational teams; we’ve welcomed lots of young girls and boys as paddlers. We’ll provide the boat and paddles, if you don’t have them! Thank you L.L. Bean for generously donating canoes, paddles and PFD’s to the Run of the Royal. L.L. 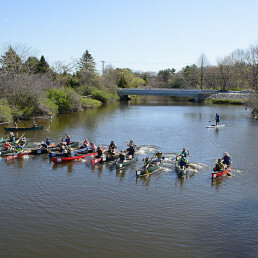 Bean will be hosting a free paddlers clinic on Wednesday May 15, 2019 at the Yarmouth History Center from 5:30 to 7:00pm for those who would like to join. Pre-Race Meeting, 9:30 am at the boat ramp – A representative from each team must attend a pre-race meeting immediately before the start to review the course, potential hazards, medical emergency procedures, communications and safety procedures. This information must be distributed by the representative to all team members. The race starts at 10:00 am. Life Jackets – Maine law requires life jackets to be worn by all paddlers on the water. Whistles are provided at race start and must be affixed to life jacket of one jacket per team. 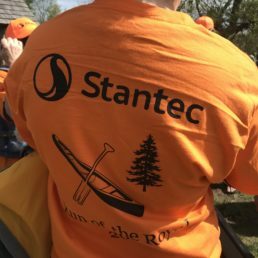 For teams using canoes provided by RRCT, we will provide you with two life jackets and two paddles. Therefore you will need to pass them on to the next leg, or bring more life jackets or paddles of your own. If you are bringing your own canoe, you will need to provide your own paddles and life jackets. No need to pass on the jackets to the next leg as long as everyone paddling is wearing one. Boats and Paddles – If you are bringing your own canoe and paddles, the paddles shall be single blade only (i.e no kayak paddles). There are no boat categories. 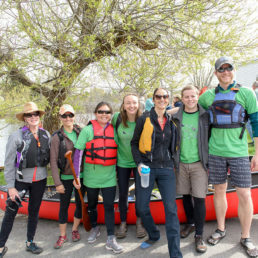 We’ll provide canoes (16′ Discovery or equivalent) to all registrants who need them, and two paddles per boat, and two PFDs, and coordinate in advance of the race on gear. 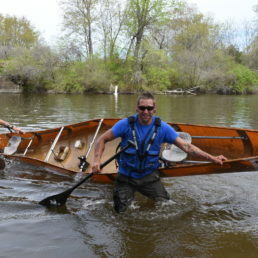 Plan to use just one canoe, and swap the canoe with each relay leg. Some folks bring racing boats or personal recreational boats; the boats we provide are recreational boats. We aim for fun, more than competition. Race Lengths – Teams must select one of the two race lengths available before beginning the race, and may not switch during the race. Teams that do not complete their assigned length will be disqualified. Each boat will have its assigned number affixed to both sides of the bow. The team captain will receive the stickers at the registration table. Paddlers- Paddlers may paddle as many of the (4) legs as they wish. 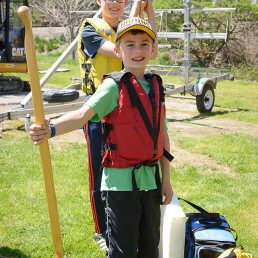 We encourage friends, family, young girls and boys, as paddlers. Pass offs – Contestants must pass off their boats to team members at the relay transitions without assistance. Alcohol– Possession or consumption of alcohol during the race, at the start or at the finish is against Maine law and prohibited. Consumption of alcohol at the Yarmouth History Center (YHC) or at Royal River Park is strictly prohibited. Transportation- Competitors are responsible for their own transportation. Parking is at a premium and carpooling is highly recommended. There will be no parking in the YHC lot during the event, and the Royal River lot across the street will also be closed to race competitors. We have access to the lot at William H. Rowe School. We will NOT have a shuttle bus running this year. Awards- The awards ceremony for the shorter course option will be held at approximately 12-12:30pm, and the awards ceremony for the longer course option will be held at approximately 2-2:30pm (pending weather and results). Post Race celebration- Maine Beer is hosting everyone and their friends at 3:00 pm in Freeport after the race. Join us! 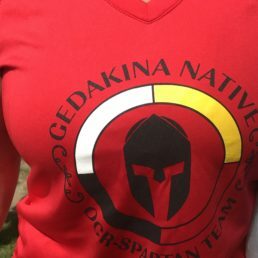 2019-Team Details with more details, distributed to team captains in advance of the race. 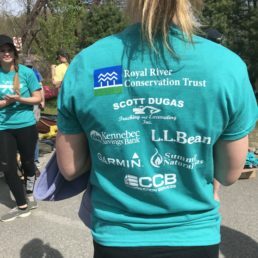 2018 Race Results: For the 3rd annual race in 2018 we had 21 teams (more than 150 paddlers) from companies and groups including Summit Natural Gas, Scott Dugas Trucking & Excavating, Planson, Hancock Lumber, L.L. Bean, Garmin, Stantec, Maine Beer, Maine Magazine, CCB Construction Services, and more. Congratulations to our winners Gedakina (long course) and Yarmouth Boatyard (short course). View full 2018 race results and splits! 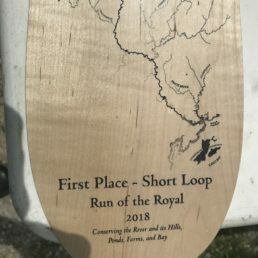 2017 Race Results: With great weather and amazing enthusiasm, the 2nd Annual Run of the Royal was a huge success. Congratulations to our winners: 1st place L.L. Bean (Aquatic Flying Sircus), 2nd place Scott Dugas Trucking & Excavating (Royal River Muskrats), and 3rd place Garmin. View full 2017 race results and splits. 2016 Race Results: The First Annual Run of the Royal in 2016 attracted 16 teams. Congratulations to the winners: 1st place L.L. Bean (Aquatic Flying Sircus), 2nd place Scott Dugas Trucking & Excavating, and 3rd place Cascon! View all 2016 race results and splits. Course map showing shorter and longer options. Learn more about this section of river, part of the Royal River Water Trail.